After the recent Limewire piracy case was thrown out for being ‘absurd’, and the music industry having been repeatedly knocked back in court cases over piracy, it’s interesting to read more and more reports that perhaps the industry is exaggerating the impact of piracy. Rather, one argument is that file sharing and piracy online is shifting the seat of power – and that it is this that is really the issue. The industry itself, though, is still saying that the potential damage must be incorporated. For an interesting way to spend a moment of your time, read the full article here. Washington-based indie heavyweight 20 Buck Spin has acquired Bay Area death metal outfit VASTUM to their ever-expanding roster for the disbursement of band’s debut full-length, Carnal Law, set for worldwide release May 31, 2011. All fans of the darkest and harshest realms of pure old-school Swedish death metal listen up; this one is for you. While VASTUM are a fairly brand new name to the public, you’ve just been informed. Hailing from the underground music hotbed of California’s notorious Bay Area, the band’s sound permeates the most wretched, dehumanizing, true old-school death metal might on Carnal Law. VASTUM’s lineup aligns an arsenal of tight-knit musicians with current or past ties to Acephalix, Saros, Amber Asylum, Hammers of Misfortune, Infest and more, but the band’s stripped-down, gravedigging attack is more crushing and potent than many contemporary acts flying the death metal banner. Conceptually, Carnal Law explores themes of sexuality and psychic disfiguration, not in the oft juvenile way associated with underground metal, but in the more cerebral context one finds in the work of Georges Bataille or psychoanalyst Jean Laplanche. Frustration, pain, pleasure, confusion, depravity, death, life and isolation; the lines are blurred. ere. NUCLEAR hit the road for JEHOVIRUS – in Europe! 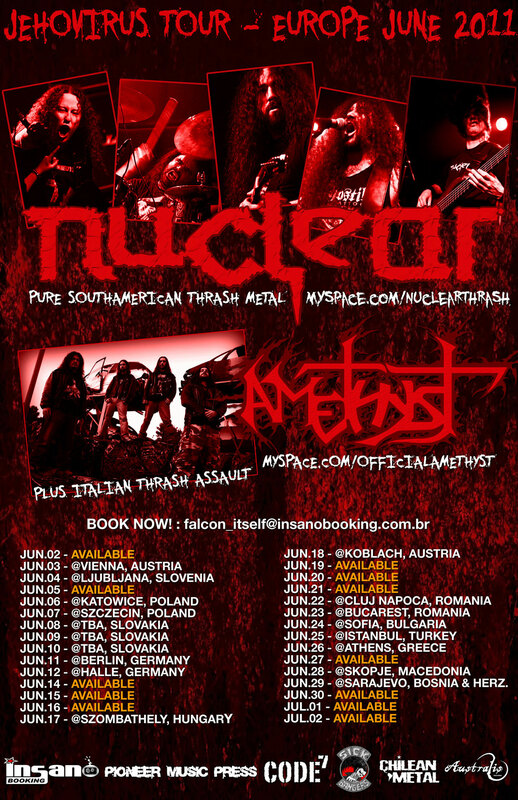 As some of you might know, Nuclear (thrash metal – Chile) will be heading Europe to promote the album “Jehovirus” during the summer season 2011. The album, recorded in Chile and mastered in UK by the reknown engineer Russ Russell (Napalm Death, Dimmu Borgir, The Exploited, etc) has received countless reviews and notes by the worldwide metal media such as Metal Hammer Magazine (UK), Terrorizer Magazine (UK), Metal Injection (USA), Close Up Magazine (Sweden) and now it is ready to hit European soil. The band along with the Insano Booking Agency are still scheduling some dates and looking for promoters, venues and bookers all over Europe for June 2011. Besides Jehovirus, Nuclear have released two previous records: “Heaven Denied” (2006) , “Ten Broken Codes” (2008) and the live album “Mosh Detonation”(2009). The band shared stage with several bands such as Brujeria, Destruction, Voivod, Forbidden, Toxic Holocaust, Hirax, Joey Belladonna, Grave, just to name a few. The tour will be supported by italian thrash metal act Amethyst.